Noble Deer is one of my favorite "masculine" stampsets. Always a good one for Father's Day. Stamp the deer/tree image in Versa Mark. Then stamp on Watercolor paper. 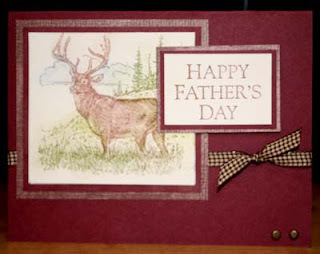 Use the sponge dauber in a brown color pastel (of your choice) over the deer image. Then use another dauber for greens (a dark green over the trees in the image, lighter green for the grass). Use another dauber for blue (for the clouds). Using that same blue, use the Aqua Painter and literally dip it into the pastel to get some color and then paint on the Watercolor paper near the clouds. You can also do the same with the brown colors for coloring the deer with the pastel with the Aqua Painter. Shake off excess powder/chalk. You can use the eraser that comes with the Stampin’ Pastels if you wish to “clean up” any of the pastels that may have gone outside the “lines”. Finish card with greeting and ribbon. Card Front has Linen stamped in Chocolate Chip over the Bravo Burgundy (very subtle).